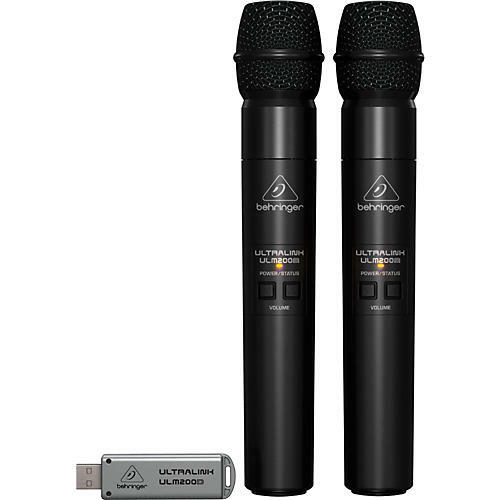 Once again BEHRINGER breaks the affordability barrier”with the new ULTRALINK ULM Series USB Wireless Microphone Systems. Now you are free to work the room to your heart's content, without the hassle and restriction of cables underfoot. Highest-quality sound is provided by the dynamic hand-held mic thanks to its built-in transmitter, which operates in the license-free 2.4 GHz range. And because the receiver can be connected directly to your PC/Mac computer's USB port, you can record directly into your favorite DAW application. Behringer's state-of-the-art transmitters and receivers operate in the 2.4 GHz frequency band, which is well out of the way of TV stations and cell phone towers, two of the main culprits that wreak havoc in the wireless zone. And because it is digitally encrypted, your signal gets through in all its pristine, high-definition quality, without the random artifacts that often plague other wireless systems. Replacing batteries in wireless mics can get expensive really fast”and having them die in the middle of your set can be a showstopper! That's why Behringer devoted extra time in developing the ULM USB Series, ensuring that battery life is extended as long as possible. You get an honest 8 hours performance time from a pair of AA alkaline batteries, which are available virtually anywhere on the planet. It can be a real hassle running back and forth to get your volume set just right, so Behringer put easy-to-operate Volume Up and Down buttons right on the microphone body. And should you accidentally wander into the œFeedback Zone, They've included a handy Panic Mute function that engages when you press and hold the Volume Down button.